KMD is one of Denmark’s leading IT and software companies. We have played a key role in digitizing the Danish welfare state for almost half a century. Today, KMD is a dynamic private business with over 3400 employees in Denmark, Sweden and Poland. We invest heavily in Danish society, and each day Danish citizens make use of our systems. This means that when working at KMD, you will get valuable insight into how IT and technology can aid and strengthen organizations, both in the public- and private sector. KMD is a Danish, international organization with head office in the Greater Copenhagen area. Being a Danish organization means that you - as a KMD employee - is close to management decisions and that our CEO sits in an open-plan office with the rest of us. We’re a progressive company with colorful, vibrant employees, and every single one of us contributes to making the workdays fun and productive. Everyone’s got a story to tell, and KMD is part of almost every Danish person’s story even though they might not realize it. The story of KMD is rich and intricate, and we’ve over the years evolved into a community of people who take pride in creating a fun, inclusive and awesome place to work. 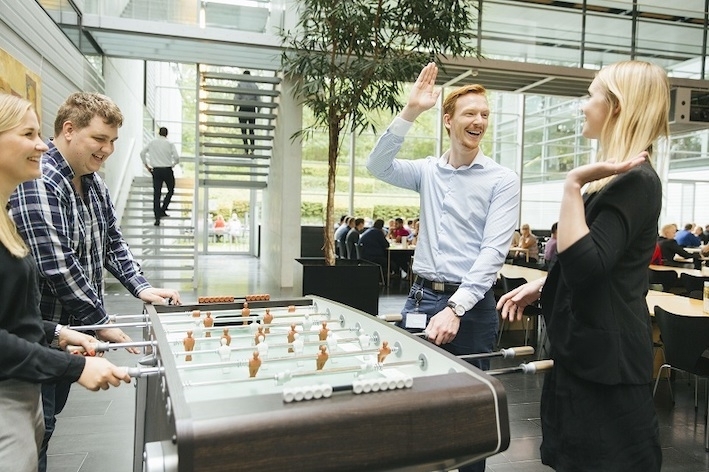 KMD is Denmark’s largest, funniest and most serious playground for IT talents. Even though some of our specialties are narrow, together we cover incredibly broadly. At KMD we don’t care how and when you get your good ideas. As long as you share them. Flexibility is the key and at KMD it doesn’t mean that you should work a lot more than you feel like. You should work because the job, the company, the customers and your colleagues inspire you. That is why it is natural for us to make sure that the framework is shipshape. That applies whether you need to exercise, receive professional stimulation, eat breakfast, lunch, or dinner, have your clothes dry-cleaned or enjoy a Friday afternoon beer. Our Graduate Program is a brilliant way for you to continue to develop your skills, expand your network and have fun at KMD. We offer a variety of Graduate tracs for all kinds of professionals. Regardless of tracks, you’ll be part of a professional and passionate team of young, talented people. Further you will be trained and be given your own mentor who will support, help and coach you. You will also be trained and given your own mentor who will support, help and coach you. Our goal is to kickstart your career. As a KMD Graduate, you will create real value for real people and societies. You will be exposed to real-life IT- and business problems, and you will have to work hands-on to create solutions, solve issues, and collaborate with a variety of people both internally and externally. Our customers rely on us, and we don’t disappoint. This is also why we need people like you! Forget everything about slow days at the office; being a part of the graduate programme requires passion, skill and curiosity.